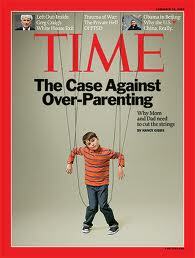 Huffington Post Parents posted this article: Is there such a thing as “too much parenting”? What do you think? Give me an example of when you pulled back on the over-parenting. How did it work out for you? I’ll start. My middle son almost never has shoes and socks on before getting in the car in the morning. Yesterday, after a number of run-ins with him about getting out of the house, I told him tomorrow was a new day. This morning, he pushed a bunch of my buttons (eating slowly, forgetting his water bottle, etc. ), but he had this shoes on before leaving the house. Trust me, this is one minor example of something that worked, but it’s a struggle for me to find the balance between being conscientious and helicopter. I want to take pride in guiding my kids, yet I want them to do stuff on their own and feel proud of it. There are lots of articles (including a good one from Time in 2009) and books on this topic, so let’s get our own conversation going. For more about my own struggle with over-parenting vs. conscientious parenting, see Subtext.